‘T is the season for gatherings, friends, family, and, of course, knitting. Our second annual Saskatoon Knitting Circle Holiday Gathering saw us celebrate all things knitterly, and Christmassy, in style. 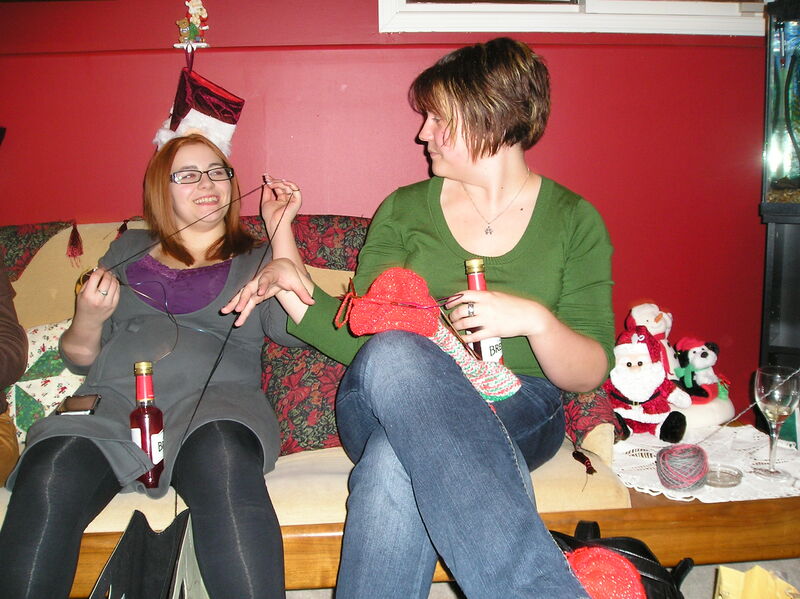 I hosted this year and the members of SKC enjoyed each other, broke in their holiday taste buds, and knit in style. 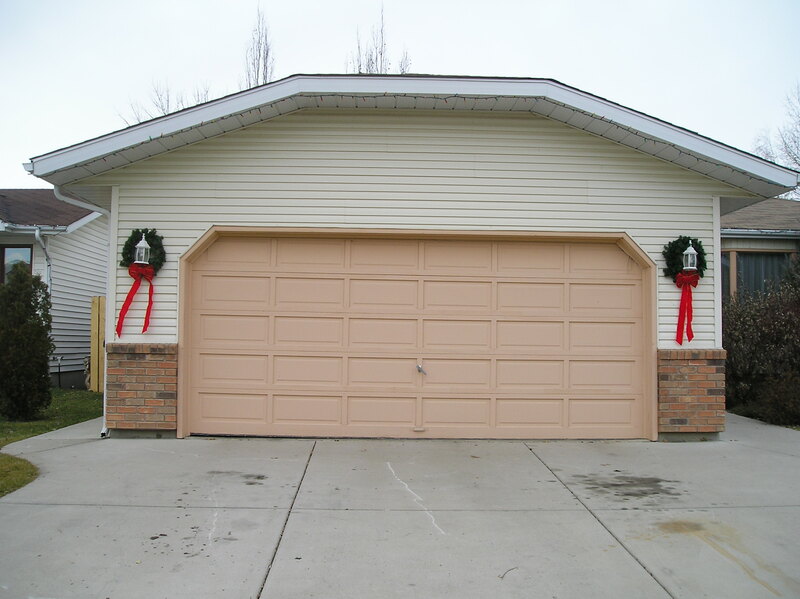 Even the garage got a bit of holiday sparkle. With the house all decked out (inside and out) we were ready to greet the members of SKC plus our two local yarn store owners. Charlene, owner and operator of Prairie Lily Knitting, came equipped with confections and knitting in hand. 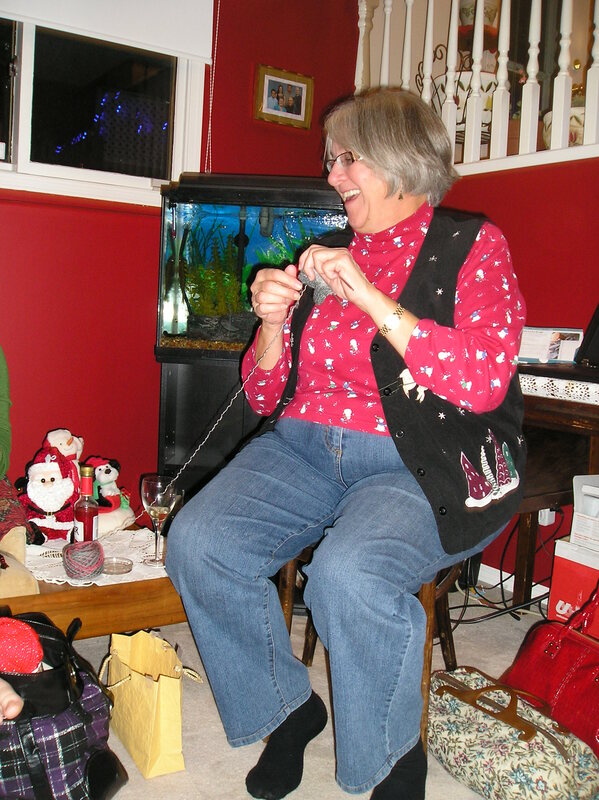 Glenda, owner and operator of The Wool Emporium, joined in the fun as we stitched the evening away. We gartered and giggled well into the evening hours and appreciated the rare opportunity to socialise with a get to know our LYS owners a bit better without the activity of business getting in the way. (Too bad I didn’t someone didn’t think to take a group picture of us in our holiday best. Christmas has come to our house. Myrna, in her holiday best, gartering and giggling with the rest of the gang. Note her festive ensemble. Speaking of holiday best, Myrna came decked out in a holiday ensemble fit for a queen. The attire, complete with a snowman themed top and Christmas themed vest, complimented her fun and creative personality. Did I hear your thoughts turn to food (yes, I am just that good that I can hear your thoughts)? What type of sweet and savoury treats do knitters enjoy? Confections were plentiful as we stuffed ourselves with fudge, appetizers, cheeses, and spreads. Even though knitting is first and foremost on our minds, we do tend to break for sustenance in order to build up the caloric energy that is expended on the process of knitting (oh yes, and we mustn’t forget the occasional libation). I must give special thanks to Bev and Myrna for providing our knitters with the opportunity to indulge in a holiday libation or two. I have learned to appreciate Myrna’s husband as he makes his own wine, Niagra Mist. It is a must try! Melissa and Bev stitching away on socks & lederhosen. (Bev provided a brief update on the red Engineering Sweater). 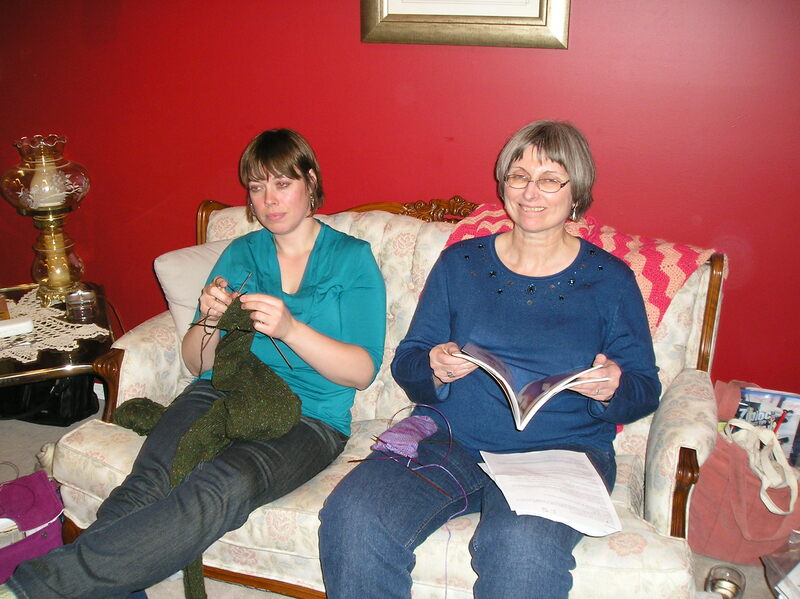 Conversation topped the list as various knitters pulled up a comfortable spot and knit and knattered the evening away. Toads as office pets topped the list of interesting topics. Yes, I did say toads…you know the one’s that are poisonous (if you lick them). There is no holding back for Lisa. She jumps right on in and has a soft spot for forlorn waifs of the animal persuasion. Here’s hoping she resists the urge to lick a frog while she works away the day (that ultimately ought to be used for knitting…but then again a pay check helps feed the addiction). 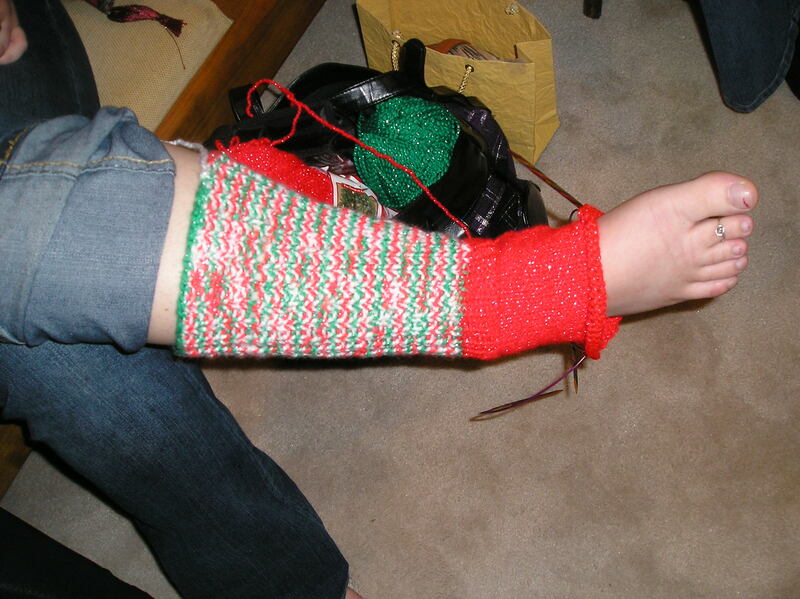 Lisa and Mary were busy knitting on a shrug and toe up socks. FYI: Did you know that for approximately one year new members were known as Lisa? We do have an official Lisa and were excited to see her join us. However, the unofficial Lisa’s were treated to a giggle as Melissa recounted her memory lapses. 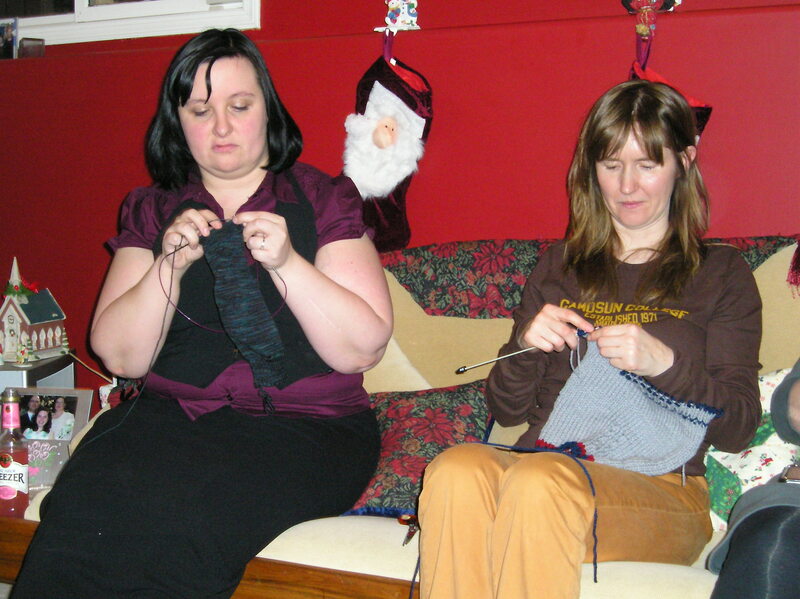 Our holiday celebration provided Saskatoon’s LYS owners and SKC member with more fun than a bag of yarn gives a cat. We’ve officially decided that more such gatherings are needed. Mary ought to share her yarn dying talents and host a yarn dying party. Melissa ought to share her spacious patio and provide us with a place to gather while our men barbecue up delectable summer taste explosions. Any other offers out there? Care to share your corner of the knitterly world and host an SKC gathering? Did I hear a request for the sharing of more knitting? Jeanette has been busy stitching up a storm. 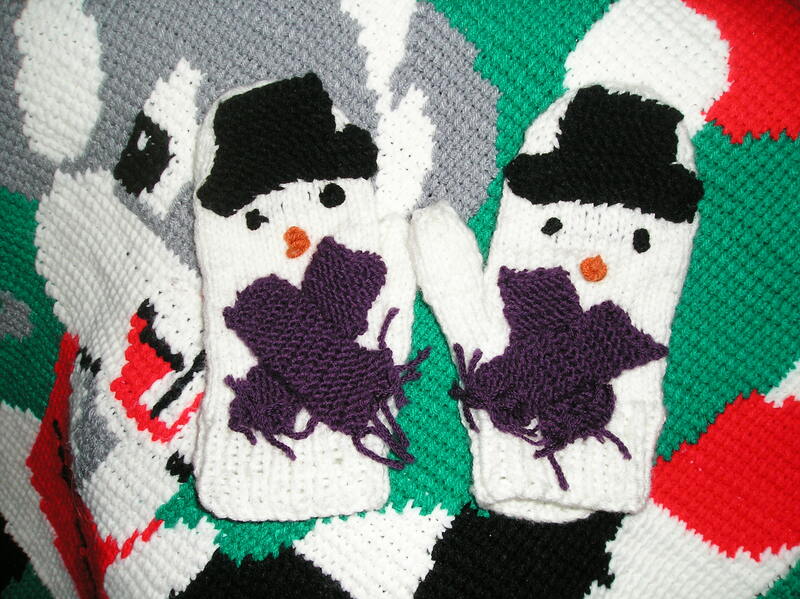 She’s finished a pair of socks and some Snowman Mittens. 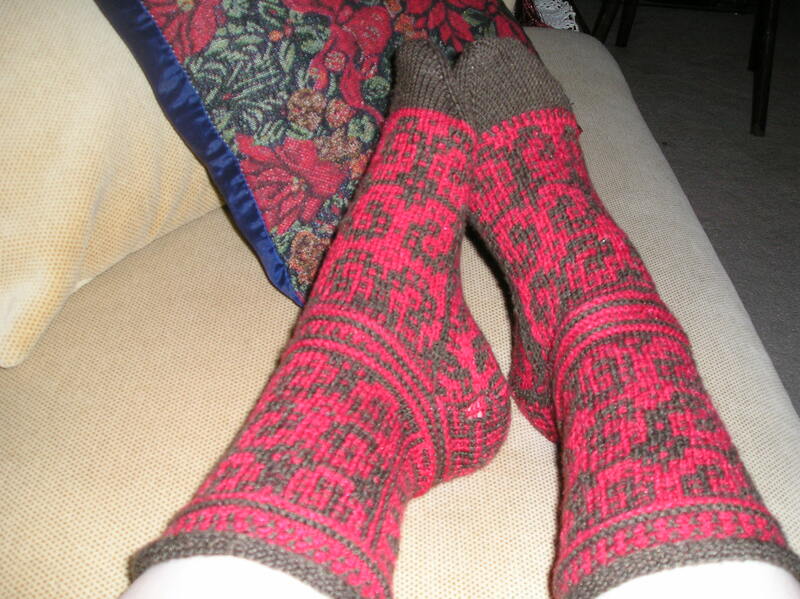 Toe Up Socks by Jeanette. Knitterly distractions have kept me from dealing with the dust bunnie revolution. 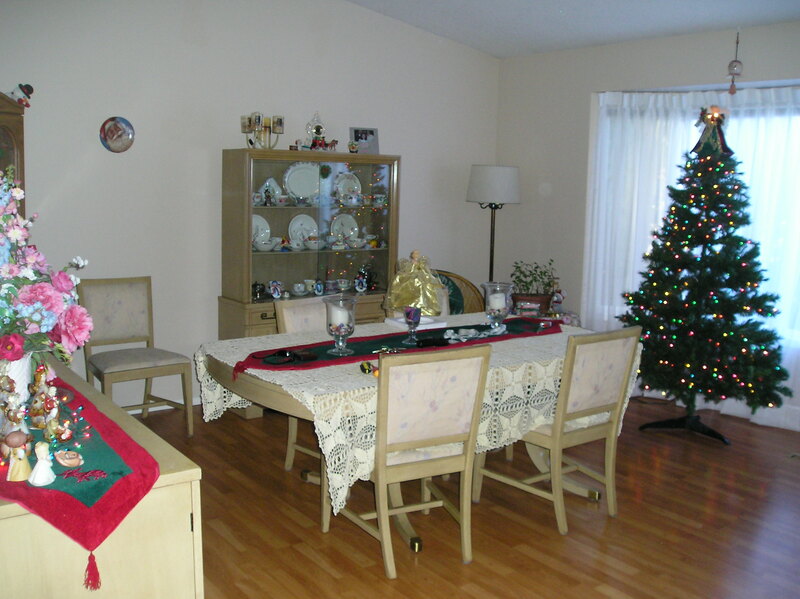 They seem to have quieted since the start of the holiday celebrations, but they always lay in wait. However, one must have priorities mustn’t one? What are those priorities…all together now…KNITTING. Curlie Cues are complete a year after their start. This is a technique that I’ll keep in my inventory of knitterly knowledge. The colourwork is not exactly stranded. One works each row with only one colour at a time. A combination of stitching and slipping creates a pattern that is easily mistake free and pleasing to the eye. Check out Red Bird Knits (sock of the month club) for more information on this, and other, inspirational sock knitting techniques. I have cast on another version of Mr. Greenjeans with Malabrigo yarn. I have started a capelet / tree skirt with Lion Brand Wool Ease (fisherman) from Michaels (Heh, if it is good enough for Charlene to buy a skein or two then it is good enough for me … but more on that in another posting). I have started, frogged, and started again. Maybe the skirt will be ready for next year…maybe. In the meantime I’ve been enjoying some seriously uncomplicated knitting. 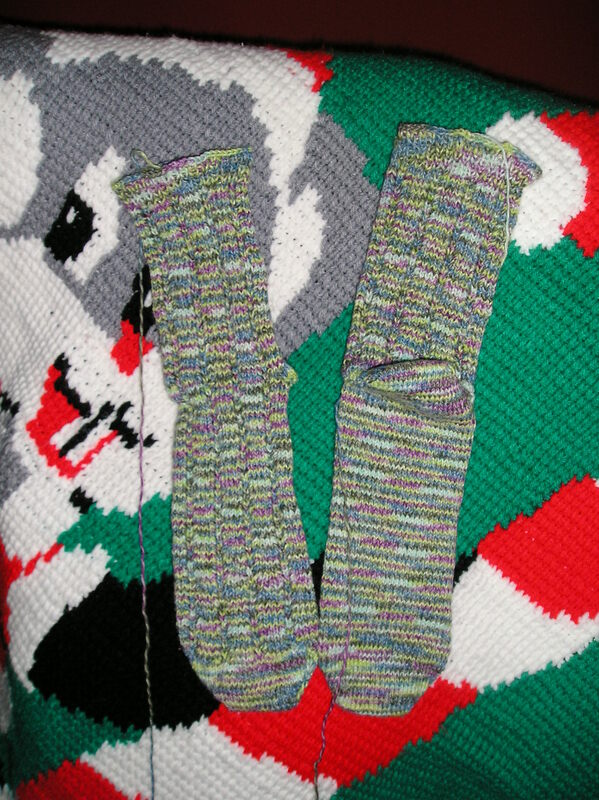 I am part way complete sock #2, but sock #1 is glorious. Vain Vanilla (started during our Holiday Celebration) will be for me. 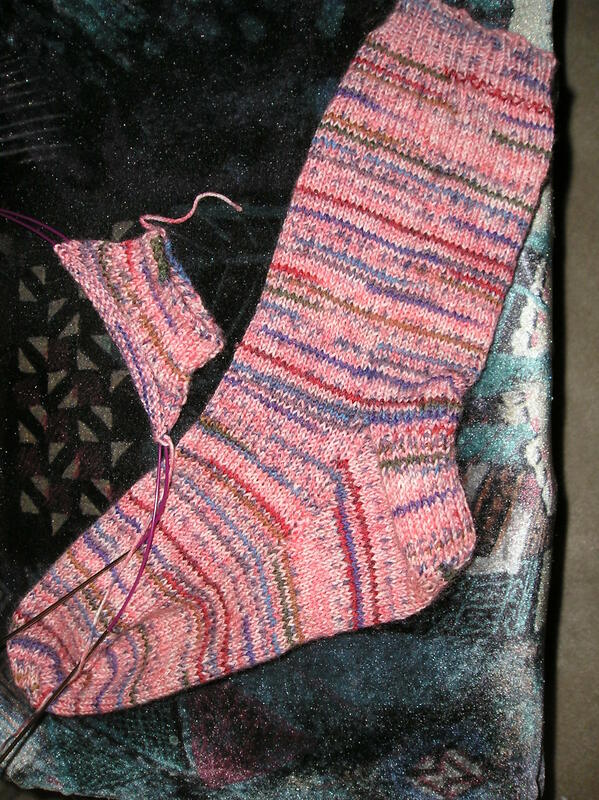 My next cast will be socks. I love socks. Happy Stitching everyone! Care to share your favourite SKC holiday memory? I’d love to hear from you. Just post in the comment section below. ← What has the internet done for you lately?